Today, I’m sharing a super fun craft to use with your littlest one. 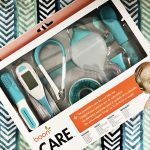 It’s always fun to keep track of your baby’s age from month to month because they grow so fast! 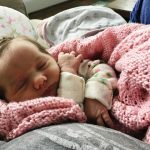 I love the milestone blankets that I have seen on Instagram & Etsy. I totally could have just purchased one, but I am one of those people that always want to attempt to make my own version of an item. So I did:) Today, I am going to share a fun project to help track your baby’s first year, a DIY milestone blanket. 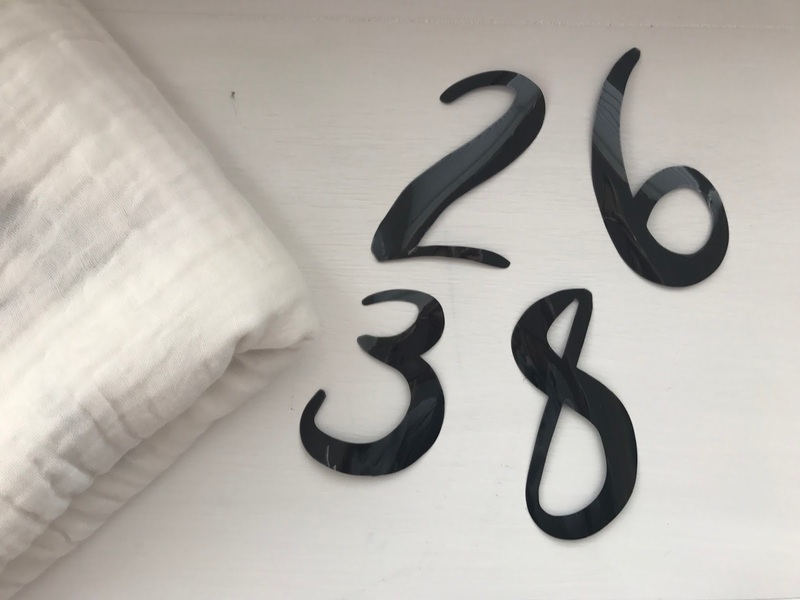 I used my Silhouette to cut the numbers (which I will explain in further details below), but there are two other simple ways that I thought of to do this craft if you don’t have a Silhouette. Buy some black paint, number stencils, & letter stencils. Paint the numbers and letters letters on using the stencil & paint and let dry. You could also add the polka dots using a circle sponge. Another option would be to buy the iron-on numbers and letters. Then, all you have to do is iron them on the swaddle blanket yourself. 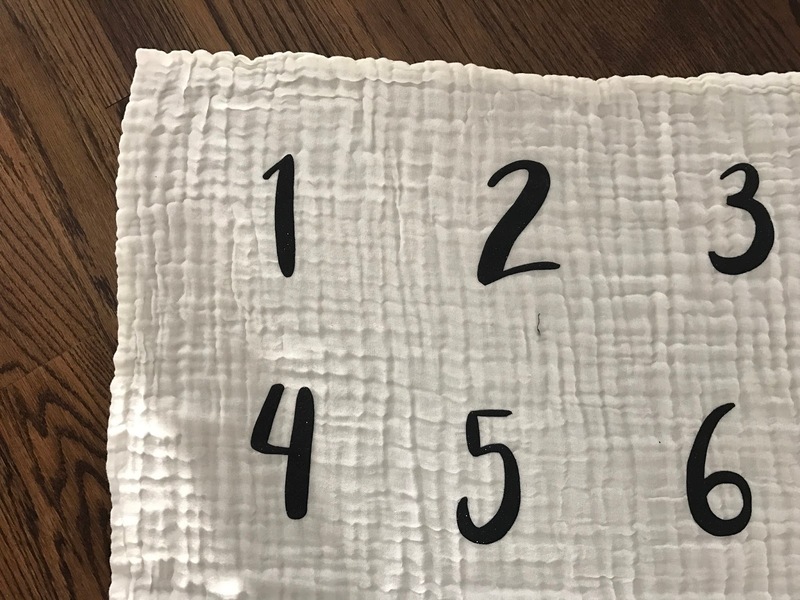 Now, below are the directions that I used to create the DIY milestone blanket using the Silhouette. Step Two: Weed out the excess vinyl but make sure to leave your design on the clear backing. Step Three: Spread your blanket out & space your numbers as you would like them to appear on the blanket. You can pin them in place if you would like OR tape them down until you are ready to iron. If you want to be super accurate, you can measure and place accordingly. I just “eyeballed” the design and it seemed to turn out pretty well! Step Four: Now, it’s time to iron! 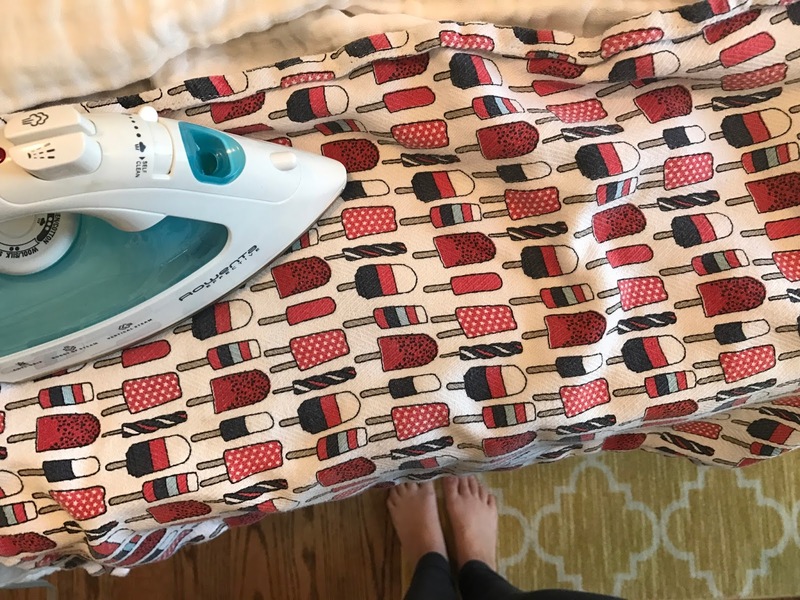 Lay your blanket out flat on the ironing board. I started with the top row and worked downward while ironing. Make sure that your iron is set on the hot setting (mine was pointed at linen/cotton setting). Be sure that the clear backing is facing up & the vinyl is touching the blanket. Place a dish towel (or another piece of extra material) over the top of what you are ironing. Press your iron down on the design section by section for 30-45 seconds at a time. Move the dish towel and let the area cool for a short bit and then try to peel up the clear backing. If the vinyl stays on the blanket, then you can go ahead and peel the plastic clear backing. If the vinyl does not stay, I would try to iron again using this same method. 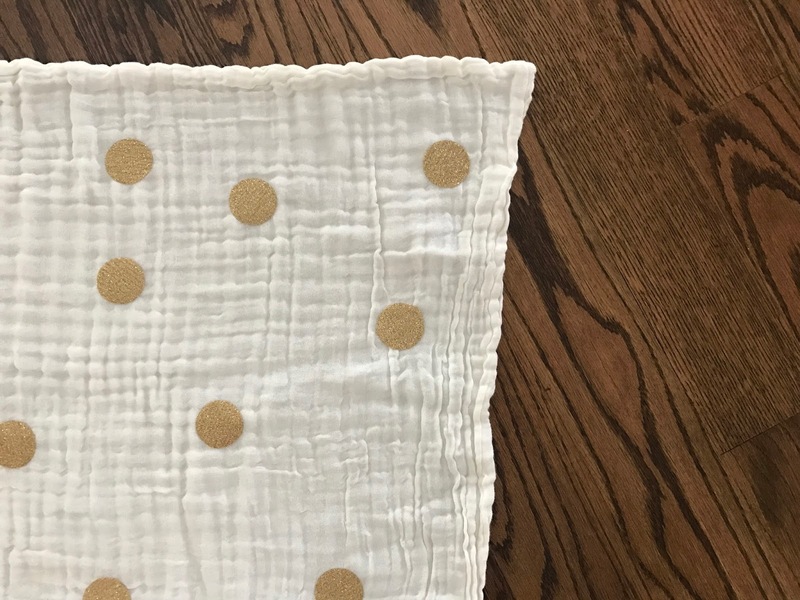 Step Five: I repeated this whole process with gold polka dots that I wanted to help “jazz” up the swaddle blanket. I cut out the circles using a gold glitter heat transfer vinyl and followed these same steps to complete the blanket. 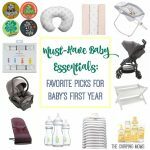 We hope you enjoy this sweet way to remember baby’s first year! Such a cute baby and a great idea! Do you by chance remember about how big (inches wise) you made each number? The numbers are about 3-3.5 inches long! Which is the best method if you want to use the blanket? This blanket that I featured in the post using the Silhouette method has been washed several times with no problems (if you purchased iron-on vinyl, this should be fine as well!). I also think fabric paint should be fine as the paint is created to be washed on fabric! What size are the numbers and the blanket? What size are the numbers and blanket?